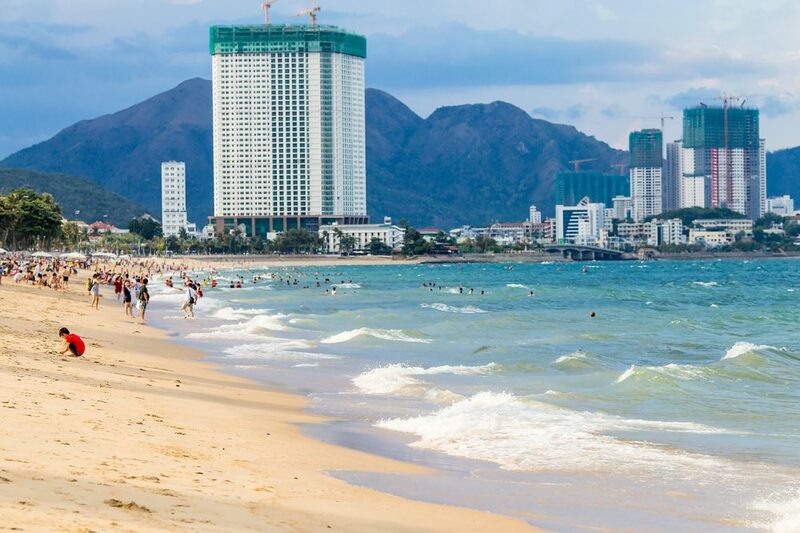 There’s no other place like Nha Trang, a beautiful coastal city in South-Central Vietnam. Mother nature has granted this place with everything that makes it one of the most popular destinations in Asia – smooth sandy beaches, majestic mountains, impressive skyline, crystal turquoise water, and many more. Here is the ultimate list of top things to do in Nha Trang that you wouldn’t want to miss. Located on Hon Tre Island across Nha Trang Bay, Vinpearl Land is a paradise for leisure activities that will fill your whole day with fun and laughter. The amusement park includes five main areas: Water Park, Outdoor Playground, In-door Playground, Aquarium, and Performance Stage. With various entertainments of all kinds, Vinpearl Land definitely is going to satisfy every kid and kid-at-heart. It is highly recommended to visit Vinpearl Land during the dry season, between January and September. This weather is warm and ideal for outdoor activities and taking photographs. If you are looking for thrilling experiences, grab some friends and head to the Outdoor Playground. This area is made exclusively for adventurous people who want to challenge themselves through activities such as the alpine coaster, flying carousel, roller coaster and pendulum ride. Prepare to scream your head off! In-door Playground is a great place to spend quality time with your family. There are lots of fun and gentle games that everyone will love, especially kids. Start a journey to the magical undersea world at the Aquarium where you get to see more than 300 different sea creatures. Immerse yourself in cool fresh water at Water Park with endless colorful slices, then soak up the sun on Splash Bay – the largest floating bay on earth. Gather around Performance Stage at night to watch the spectacular Dancing Water Show that would be a perfect end to your day at Vinpearl Land. There are two ways to travel from Nha Trang city to Hon Tre island. Another option for you to choose is speed boat, which departs every 30 minutes from Phu Quy dock and takes approximately 5 minutes to arrive at Hon Tre Island. Enjoy the ocean breeze while you’re on board. For those who are into marine life exploration, there are tons of water activities that cater to all ages and swimming abilities. Snorkeling and scuba diving are definitely the best ways to see up close the magic of the ocean – stunning colorful coral reef, beautiful tropical fishes along with many of other sea creatures, and you know what, everything is just right beneath the water surface. You’re bound to be mesmerized! The best time for a snorkeling/scuba diving trip is in summer, between June and August. Sun shines all day and the water is crystal clear which offers you with perfect visibility. There are two highly recommended spots, Hon Mun Island and Monkey Island. Hon Mun has allured many divers for its biological diversity, with more than 300 coral and thousands of fish species. You’ll have an amazing opportunity to immerse yourself into deep water and swim among those beautiful sea creatures, making every moment of this trip unforgettable. As its name indicates, Monkey Island is home to 1,200 monkeys. You’ll get to know more about them as soon as you arrive here. The average depth of sea in Monkey Island varies from 3-5 meters, which is perfectly safe for people to go diving/snorkeling, even the inexperienced among you. Apart from gorgeous beaches and beautiful landscapes, Mother Nature has also granted Nha Trang with priceless clay mineral resource that is utilized to create the unique, distinctive experience of mud baths. With therapeutic, skin healing benefits, a mud bath helps increase circulation and moisture, leaving you feeling fresh! Such a wonderful way to treat yourself! Don’t forget to note down these famous mud bath spots below for a quick reference. Located 8 kilometers away from Nha Trang city centre, surrounded by natural scenery, the mud baths here in Egg Mud Baths are all designed in egg shapes along hillsides with many colorful plants and flowers alternating. This place offers a variety of services including a hot mud bath, mineral pool, herbal bath, hot steam and beauty spa. Making a name for itself as the first place to run mud bath service, there’s no reason you should skip Thap Ba Mud Bath. Get rid of all stress and tiredness as you take a dip in the hot, mineral-rich mud while basking in the fresh forest landscape all around you. Another ideal spot for a mud bath experience is I-Resort, with its rustic yet luxurious design. Like an oasis hidden among majestic mountains and green wood, this is such a perfect place for you to get away from all the hustle bustle of the city life and start your own self-care journey. Want to learn more about Vietnam’s rich history and culture? Galina Dream Show is certainly a must-watch! With more than ten performances, this performing art show of dance will take you on a beautiful journey stretching from the north to the south, from the time of building and defending the country to the sublimation of the present life. Whether it is Northwest, Central Highlands or Mekong River Delta, you’ll find yourself just there. Get ready to be mesmerized by the best performers dressed in intricate costumes as they let you see every inch of Vietnam without leaving the room! The Galina Dream Show takes place at 7:30 PM every Tuesday, Thursday and Saturday at A Chau Theater, 62 Thai Nguyen, Nha Trang City. Ticket price is 350,000 VND per person (~$15) with a discount applied for children. Don’t forget to note down this show on your list of top things to do in Nha Trang! Did you know that Nha Trang is blessed with some of the most gorgeous offshore islands on earth? Join a one-day trip to discover Nha Trang four islands, nature and beach lovers! Not only will you have a chance to immerse yourself in the beauty of ocean landscapes, to enjoy snorkeling on the stunning coral reefs, but you’ll also get to try many delicious seafoods that can be found nowhere else. Not to mention some fantastic water sports for you to join as well! The tour starts roughly at 8:30 AM. Destinations include Mun Island, Mot Island, Tam Island and Tri Nguyen Aquarium. You’re going to spend around two hours at every of these spots before traveling to a new one. It’s highly recommended to bring your own swimsuits, towels, sunscreen and other personal necessary items. Get excited? Book a four islands tour in Nha Trang with Inspitrip today for your best experience! Imagine you’re up above the sky, feel the breeze as it fingers your hair and captures all beautiful corners of the city in your eyes – you’ve already painted yourself riding on a hot air balloon over Nha Trang. Originally established in Tam Island in 2010, the hot air balloon ride center near Pham Van Dong Street has been operating for almost ten years. With giant colorful balloon and safety equipment provided, the 20-minute ride carries you to around 150 meters (500-foot) height above the ground. Ticket price for one ride is 100,000 VND (~$4 USD) in the morning and 120,000 VND (~$5 USD) in the evening, and even further discounts are applied for children. It’s absolutely a great experience that you don’t want to miss. To all true free spirits out there, let’s set your sail to soar with the wind! Join a sailing trip around Nha Trang Bay and take your adventure to a whole new level. Under the clear sky with white clouds floating, right in the midst of the blue ocean, time becomes endless and you’ll be filled with refreshing, peaceful feelings. Sailing boat runs at fairly high speed using wind power, so there’s no noise, no smell of fuel or smoke from engine like other transportations. You can be totally relaxed in a quiet space to sunbath, read some books, take photos and observe the city from a far distance. In case you’re a party person, you can even throw a small party with your friends right on board! Going sailing is such a luxurious, eco-friendly experience that everyone should give it a shot as one of the lesser know things to do in Nha Trang. Book a sailing trip and start your own journey as soon as you arrive in Nha Trang city. Bon voyage! Vietnam is such a heaven of food. Every city, even every village has a specialty of its own, and so does Nha trang. It’s no doubt saying that your trip to this coastal city will not be complete without tasting the delicious, authentic street food here. Savory fish sauce, fresh seafood ingredients and distinctive sweet taste are some features that best represent the food culture in Nha Trang. Want to eat like a local while traveling? Quickly note down our list of recommendation! Fresh, fresh, fresh! The ingredients are countless: fish, shrimp, octopus, crab, sea urchin, scallop…and everything is newly caught from the sea. From boiling to stir-frying, steaming, grilling, mixing with spices, or any other cooking way, the seafood dishes here are ultimately yummy and delicate. No one (not even a local!) is able to resist the inviting smell and succulent taste of a grilled pork roll. Being served with raw vegetables and fish sauce, this dish tastes just like heaven. There in the small bowl is a wonderful mixture of fresh fish, fried fish cake, broth of steamed sailfish and raw herbs. This rice vermicelli with fish, or “bún chả cá” truly brings you an authentic taste of Nha Trang’s sea breeze. Though you can find crispy pancake in almost every part of Vietnam, Nha Trang crispy pancake is a bit special as it is made with squid instead of just pork and shrimp. Eye-catching and mouth-watering, definitely enjoy it while it’s still hot to get a full flavour. This is the best option for a BBQ dinner. Mixed with honey and various seasonings, the beef is grilled deliciously enough to win even a foodies’ praises. With secret recipes being passed from generation to generation in Lac Canh and Nha Trang, this dish is an appetizing delicacy. Established in 1923, the center is such a haven for those who have huge passion for sea discovering. You will stand a chance to visit the Marine Creature Museum, which shows more than 80,000 marine species that are residing in the giant glass tanks. Located at the foot of Tray Thui Mountain, Long Son Pagoda is the largest pagoda in Nha Trang. There is a 79 feet tall white Buddha statue, Kim Phat Than To, sitting atop the mountain crest where you can overlook most places in Nha Trang city. Ponagar Tower was built by the Cham civilization between the 7th and 12th century as a dedication to Yang I Nu Ponagar – the mother of the Kingdom. The attraction allures many tourists through its glorified structure with amazing architectures filling with stunning colors. Let’s explore Nha Trang city in one day with Inspitrip! Nha Trang’s subtle and relaxing local atmosphere is quickly replaced by a festive vibe as soon as the sun goes down and the lights go up. You can feel it in the air, as the crowds of light-hearted travelers fill up every casual venue of the city. Nha Trang nightlife demonstrates a combination of both old and new, with rustic neighborhood bars holding their own against glitzy rooftop nightclubs and luxurious five-star hotel lounges. No matter which style you prefer, Nha Trang has it all. It is an amazing experience for you to meet fun-loving, local people and other fellow tourists until the early hours of the morning. Every venue offers plenty of spot-on drinks, excellent pub grub, live dance performances, and different music genres. If you are a true craft beer spirit, consider Louisiane Brewhouse & Restaurant or Guru Sports Bar. Most of the most popular hang-out spots, including Why Not Bar, Crazy Kim’s Bar, Makaï Lounge and United Bar, provide very casual drinking venues. However, for those who enjoy chilling with a view, don’t hesitate to check out these rooftop and open-space nightclubs, Sailing Club and Skylight Skydeck & Rooftop Beach Club.